I read this blog post from the CORE Education blog Modern Learning Environments: Not ‘any colour as long as it’s black’ and the second part of it headed up Teacher learning really got me thinking. Firstly, a disclaimer: I have never taught in a modern learning space. These are simply my thoughts and observations from what I have seen, read and heard. 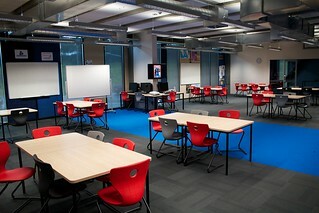 I imagine, although I cannot be certain that probably 95% or more of schools in New Zealand do not have modern learning spaces (I would love someone to tell me that I’m very wrong about this!). There could be a number of reasons for this, but I imagine that the most likely is that most of our schools are aging, and the funding that they receive for building and maintenance does not enable them to modernise across the school very quickly – they either have to do one or two classrooms or a block at a time, or try to do a little bit across all/many classrooms. I have a little bit of experience as a Board of Trustees member and when it comes to buildings there seems to be a balancing act between these classrooms must be replaced now and let’s be fair across everyone and upgrade a part of every classroom so that it’s consistent across the school. I believe many of our schools simply haven’t been given a real opportunity to update themselves, so unless you’re in a brand new school, chances are high that you’re teaching or learning in silos – in individual classrooms separated from one another by four walls. It has been my observation that sometimes (certainly not always the case) these classrooms become a certain teachers domain, and although some are willing to collaborate, often collaboration does not occur at the level perhaps needed/desired. Interestingly, I have also observed in online “classrooms”, in what could be considered a modern learning space, that we talk a lot about how collaboration and interaction can occur with students but seem to do little of it with teachers. The technology we are using to run these online classes is set up for communication and interaction but it appears often that only goes as far as our students. Yes, I am generalising, and I’m sure those that are reading this blog are collaborating with other teachers in a variety of ways, however I know this is not always the case. I strongly believe that if we have these expectations of our students, then we as teachers need to be doing it too. We need to collaborate with teachers in our schools and build professional networks to learn, to grow and to inspire us. We need to do what we can to move out of the comfortable silos that we we have grown accustomed to and share our experiences with our colleagues. This year I have started team-teaching online with two other teachers. It’s going to be an interesting journey as we bare all in how we teach and interact online. I think it will be good for all of us because we are having to be open and because we are able to learn from each other. We have no choice but to work together. BTW: The CORE Ed blog is well worth following if you don’t already.